Sarah and Duck (from the TV show on ABCkids) travelled across from the UK to perform live to young Australian audiences. Two of the most unlikely friends (a duck and a little girl) decide to put together a birthday performance for Mrs Scarf's birthday. The hour hour long performance (with no interval) has been put together to entertain a preschool audience. The cast of four puppeteers act out the story using the characters and the voices of the actors from the TV show. If you have little ones who love the TV show, this live stage show is a sure-fire hit. 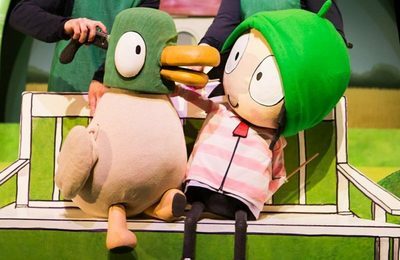 Keep up to date with Sarah & Duck's Live Tour head to sarahandducklive.com to see if the two TV stars will make their way back to Australia again soon.